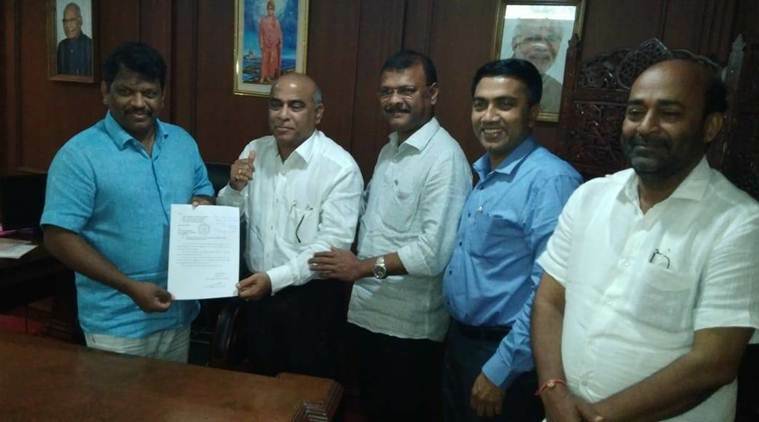 Goa Assembly Speaker accepting the letter from MGP leaders. In a late night dramatic development, two MLAs from the Maharashtrawadi Gomantak Party (MGP) joined BJP. With this BJP now has the strength of 14 legislators in the house, equating Congress. Meanwhile, the prospect of MGP’s Sudin Dhavalikar remaining the deputy chief Minister remains “doubtful” and in the hands of chief minister Pramod Sawant. Speaker Michael Lobo confirmed saying that his office was contacted by the two MLAs around 1:30 am when they walked in with a letter, and by 2 am their letters were officially accepted. “I can at this stage confirm they are now officially with the BJP. The party is expected to officially issue a statement early morning,” confirmed Lobo. The two MGP MLAs were later accompanied by Tendulkar and Chief Minister Pramod Sawant to the office of the Speaker. “We, Manohar Ajgaonkar and Deepak Pauskar have agreed to merge with the BJP. In view of sub-clause (2) of clause 4 of the 10th Schedule, and in view of the fact that we constitute 2/3rds of the members of the legislative party, such merger shall be deemed to have taken place,” the letter submitted by Manohar Ajgaonkar read. Sudin and Deepak Dhavlikar were unable for comments. When asked about opening office late at night, Michael Lobo said, “the speaker’s job is 24/7, when I got the call, I rushed to the Assembly complex at around 1:30 am”. Earlier during the negotiations, the cracks in MGP was already seen when their MLAs reached out to Nitin Gadkari even as Sudin Dhavlikar continued to ask the time. “There were efforts to topple the government. They (MGP) wanted to form a government with the Congress,” claimed Azgaonkar.